“Our blood is a great testimony to your crimes.” These were the last words and the will of Azam Shadbakhti, a 17-year-old student from Arak. Despite her age, Azam Shadbakhti was a great teacher. In the short time of her life, she was so inspiring that, 12 years after her martyrdom, the little girl living next door to her joined the struggle against the misogynist regime in her place. It might be fitting to get acquainted with Azam Shadbakhti from the view point of that little girl. “I remember the day when I heard the news of martyrdom of Azam Shadbakhti in the cries of my mother. They had brought her body to her mother demanding the money of the bullet they had used to execute her before handing her in! Later, I realized that they had raped Azam before her martyrdom. “I had seen Azam myself at the Vali-Asr Hospital in Arak, where my mother worked in the nursery. Because my brother and I did not have any other caretaker, we went to the hospital with my mother. Those days, they sometimes brought tortured prisoners to the hospital to heal their wounds so that they could torture them again. One night, I saw Azam who had been hospitalized due to severe torture. Because I was small, the guards would not prevent me from going to her room. It was a joy to be able to go to Azam’s room. Azam was always an example for me. Azam Shadbakhti was born in Arak in 1964. Her high school years coincided with the 1979 Iran Revolution. She was only an adolescent when she became acquainted with the Mojahedin (PMOI/MEK) through her older brother Ahmad Shadbakhti. Azam’s rebellious spirit made her a remarkable freedom fighter, with a great passion for freedom. That was why the city’s Revolutionary Guards were after her most of the time. In school, she distributed the Mojahedin’s newsletters among her friends and answered the students’ questions with great enthusiasm. Azam’s lively and jubilant spirit made her tireless, who did everything possible to realize the cause of freedom. Whenever you asked her to do something she would do it right away. Azam had chosen to put everything in favor of the cause. It was this motivation that made all hardships easy for her. She was arrested several times while selling newsletters and because of her activities at school, but each time she was more determined when she came out. Eventually, Azam Shadbakhti was executed by the clerical regime on August 8, 1981, at the age of 17. When they took her for execution, the prisoners and even the prison guards cried for losing her, but her greatness and strength, even in the final moments of her precious life, astonished everyone. 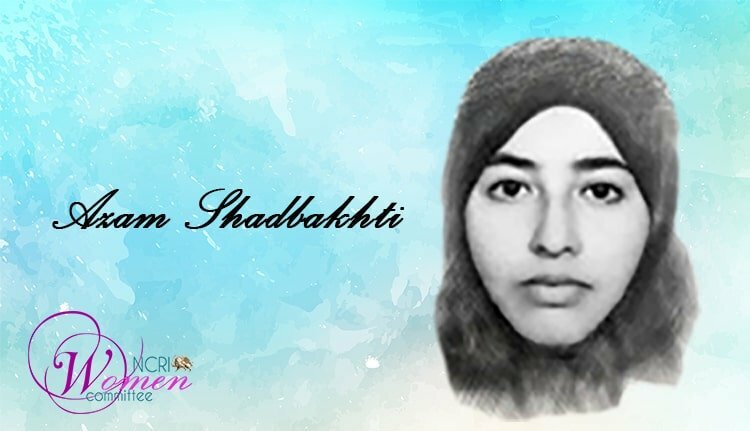 With a smile on her face, Azam Shadbakhti delivered the lesson of sacrifice and honesty and the message of not giving in to the enemy and resisting to the end. The people of Arak have never forgotten Azam Shadbakhti, and her memory has been carved forever in the hearts of the people of Arak.